Under the motto “The Ski amadé Trilogy of Enjoyment: tasty regional specialities, Austrian wines and magnificent pistes”, selected mountain lodges and restaurants in Ski amadé from now on are offering typical local dishes made from regional products. These tasty regional specialities are complemented by Austrian wines. Anyone who skis really must also have a break. In the end, a break at a mountain lodge belongs as much to a day’s skiing as wax on one’s skis. Anyone who would really like to enjoy a day’s skiing has for a couple of years allowed himself or herself a glass of wine – actually, quality Austrian wine – at lunchtime at one of 20 certified mountain lodges in Ski amadé. Of course there were always also a few suitable, typical local dishes on the menus, like, for example, Bauerngröstl or an original Kaiserschmarrn with spiced stewed plums. From now on Ski amadé is however going a little bit further, and requiring these regional dishes also to be made from regional products. In this way the guests also profit from the freshness and naturalness of the outstanding food available direct from the farmers and agricultural businesses in the region. itself. 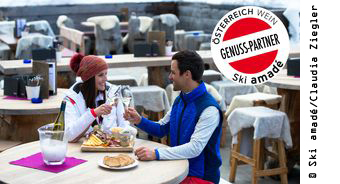 The regional Trilogy of Enjoyment dishes are listed separately on the menu, so that the skier can find them easily. Suitable top quality Austrian wines are recommended for each of these dishes. Currently 20 lodges and mountain restaurants in Ski amadé are Skiing and Wine Enjoyment partners. They are identified by a special badge at the entrance. The highlight for skiers who are wine enthusiasts is the Skiing and Wine Enjoyment Week in Ski amadé. It is taking place from 14 to 21 March 2015. Over this period numerous events on the theme of Austrian wine culture and regional specialities are offered in the 20 designated ski mountain lodges. Beside wine tastings there will also be tastings of regional products like ham, cheese, bread and pastries, fruit and schnapps amongst other delicacies. 16 selected hotels in the regions are offering special holiday packages and menus on the “regional products” theme for the Skiing and Wine Enjoyment Week.